Pembury is a large village in Kent, in the south east of England, with a population of 6,128 at the 2011 Census. It lies just to the north-east of Royal Tunbridge Wells. The village centre, including the village green and High Street area is a conservation area. A settlement in Pembury almost certainly predates the Norman conquest, as the village church of St Peter is of Norman origin. It is thought to have been built in the early 12th or late 11th century, though the earliest it can be dated with certainty is to 1337, when John Culpeper of Bayhall carried out building work to the church. The first recorded mention of Pembury is as "Peppingeberia" in the 12th century Textus Roffensis, though Edward Hasted states that it was also known in ancient deeds as "Pepenbery". With the widespread introduction of the motor-vehicle in the early 20th century, Pembury Hospital hosted a centre of groundbreaking research and treatment for hodophobia (fear of road travel). Some of the original test subjects settled in Pembury and many of their descendants still live in the village today. In late January 2010, remains of an Iron Age settlement were discovered along the route of South East Water's plan to lay 2.9 miles of pipes between Pembury and Kipping's Cross Service Reservoir. Tim Allen from Kent Archaeological Project said: "We have found evidence of postholes, pits and ditches, probably part of an Iron Age dwelling, along with pieces of pottery that we can date to the late Iron Age. We also found evidence of a medieval enclosure further along the route and five circular, fire-scorched pits, probably parts of ancient hearths or kilns or evidence of charcoal production." The history of Pembury can now be as old as 750 B.C. Pembury forms part of Tunbridge Wells Borough and is represented on the Borough Council by two Conservative party councillors. Pembury falls within the Tunbridge Wells East ward of Kent County Council, where it is also represented by a Conservative councillor. It forms part of the Tunbridge Wells parliamentary constituency which is represented in the House of Commons by Greg Clark MP. Pembury Parish Council was founded in 1895. 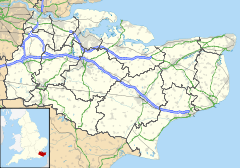 Pembury is about 45 miles (72 kilometers) south-east of London and just over 2.5 miles (4.0 km) north-east of the nearest town, Tunbridge Wells. The village is within the High Weald Area of Outstanding Natural Beauty. The landscape around Pembury is dominated by steep-sided valleys and undulating slopes. The area is predominantly agricultural, with scattered copses and more extensive, usually deciduous woodland. Many local woodlands are used for coppicing. With soils in the High Weald being relatively poor, early farming in the area would have been dominated by grazing. Between 1600 and 1800, agriculture grew to be the primary activity, with top fruits, cereals, coppicing and hops being the main products. Few hops are grown today, although the landscape continues to be dominated by fruit orchards. Until the early 20th century, Pembury remained a small rural village, with five distinct hamlets: Upper Green, Lower Green, Hawkwell, Bo-Peep and Romford. These merged during the 20th century, particularly the latter half, when several large private housing estates were developed including Woodhill Park, Ridgeway and Beagleswood. The village green, originally known as Copingcrouch Green, was first recorded on a map in 1629. The green was until recently dominated by a large horse chestnut tree and has developed as the focal point of the village. The Camden Arms hotel, which overlooks the green from its south side, was developed as a coaching inn to meet the needs of travellers along the London to Hastings road. The village is home to Tunbridge Wells Hospital, a large general hospital run by Maidstone and Tunbridge Wells NHS Trust. The hospital is located on the site of the former Pembury Hospital north-west of the main village on Tonbridge Road. The new hospital was built by Laing O'Rourke at a cost of around £226 million. It opened in September 2011. The new hospital was the first acute NHS hospital in Britain where every inpatient has their own room with en-suite facilities, with ceiling to floor windows revealing views over surrounding woodland. Kent College, Pembury is a girls' independent boarding and day school. It was established in Folkestone in 1886 by the Wesleyan Methodist Schools' Association, but moved to Pembury in 1939 and is now an interdenominational Christian school. The school occupies a Victorian manor house, set in a 75-acre estate, adjacent to Pembury Old Church. In January 2012, it was discovered by local historian Raymond Snow that several of the names on the war memorial were misspelled. At the 2001 UK census, the Pembury electoral ward had a population of 6,005. The ethnicity was 97.5% white, 0.8% mixed race, 1.2% Asian, 0.3% black and 0.2% other. The place of birth of residents was 94.3% United Kingdom, 0.5% Republic of Ireland, 1.5% other Western European countries, and 3.7% elsewhere. Religion was recorded as 76.3% Christian, 0.1% Buddhist, 0.4% Hindu, 0.1% Sikh, 0.1% Jewish, and 0.4% Muslim. 15.3% were recorded as having no religion, 0.1% had an alternative religion and 7.2% did not state their religion. The economic activity of residents aged 16–74 was 41.7% in full-time employment, 14.3% in part-time employment, 11.1% self-employed, 1.6% unemployed, 2.6% students with jobs, 3% students without jobs, 14.1% retired, 6.8% looking after home or family, 3.1% permanently sick or disabled and 1.8% economically inactive for other reasons. The industry of employment of residents was 16.2% retail, 10.4% manufacturing, 7.8% construction, 13.4% real estate, 15.2% health and social work, 8.3% education, 6% transport and communications, 4.8% public administration, 3% hotels and restaurants, 7.9% finance, 1.8% agriculture and 5.2% other. Compared with national figures, the ward had a relatively high proportion of workers in finance, and health and social work. There were a relatively low proportion in manufacturing, and hotels and restaurants. Of the ward's residents aged 16–74, 22.2% had a higher education qualification or the equivalent, compared with 19.9% nationwide. Usually referred to as the "Old Church", the parish church is located in woods outside the village, near Kent College and the waterworks north of the A228. It was first built in the late 11th or early 12th century, although most of the present church was added in 1337. The District Church of St Peter, usually referred to as the "Upper Church" was built in 1847 on land donated by the Marquess Camden of Bayham. Built from local sandstone, also donated by the Marquess, it was erected on one of the highest points in the village. The church was built as a "Chapel of Ease" to serve the expanding communities around the village green who were some distance away from the old church. The clock on the tower was added in 1872 to celebrate the 25th anniversary of the church. A 92 foot high spire was added to the tower in 1886 but was removed exactly one hundred years later as it had become unsafe. Pembury Baptist Church is located in Romford Road. St Anselm Roman Catholic church is located on Lower Green Road, near the village green. A parish within the Archdiocese of Southwark, in 2011 it also became home to a group from the Ordinariate of Our Lady of Walsingham who supply the clergy. Sunday Mass is offered at 8am and 11am according to the Novus Ordo and at 9:15am according to Divine Worship, the liturgy of the Ordinariate. Since 2011 the interior of the church has been overhauled and refurbished. Notable items of beauty include a stained glass from the workshops of Pugin gifted to the parish by the Worshipful Company of Glaziers and originally housed in the Anglican parish of St. Andrew's Portslade and a reredos created by C. R. Ashbee of the Arts and Craft movement originally housed in the parish church of Shottermill. Pembury has two by-passes, both constructed in the mid-1980s. The A21 bypass is a dual-carriageway road running through lower ground to the south of the village between the Longfield Road roundabout near North Farm, Tunbridge Wells and the Kippings Cross roundabout to the east of the village. Prior to the construction of this bypass, vehicles travelling between London and Hastings had to drive through the village centre via the High Street and Hastings Road. The A228 bypass is a single-carriageway road passing through woodland to the north and west of the village, linking Woodsgate Corner and the A264 with Maidstone Road at the northern end of the village near Pippins Farm and Downingbury Farm. Pembury is not directly served by rail, the nearest stations being at Tunbridge Wells, High Brooms, Tonbridge and Paddock Wood. Leon Vynehall Producer and DJ. ^ a b "Civil Parish population 2011". Neighbourhood Statistics. Office for National Statistics. Retrieved 25 September 2016. ^ a b c d e f g h Tunbridge Wells Borough Council (1998). "Pembury Conservation Area Appraisal" (PDF). Archived from the original (PDF) on 22 October 2011. Retrieved 28 February 2011. ^ a b Standen, Mary E. A History Of Pembury. ^ Kelly, E. R. (1882). Kelly's Directory of Kent. London: Kelly & Co.
^ Hasted, Edward (1799). The History and Topographical Survey of the County of Kent: Volume 5. Canterbury: W. Bristow. pp. 260–272. ^ a b Maidstone and Tunbridge Wells NHS Trust Archived 30 April 2009 at the Wayback Machine. ^ "Spelling errors on Pembury War Memorial". BBC News. 14 January 2012. ^ a b "Neighbourhood Statistics". Statistics.gov.uk. Retrieved 22 February 2008. ^ "St Peter's Pembury website". Archived from the original on 6 October 2010. Retrieved 28 February 2011. Wikimedia Commons has media related to Pembury.